A nice coffee mug for your special Mom. 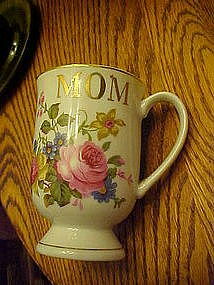 Measures 4 1/2" tall and has a pretty floral front with roses and assorted flowers, with the word MOM in gold. Other gold trims on edges and handle. Gold is excellent and not worn. Cup is in perfect condition also. Would make a great gift.